On Election Day, when voters reach the judicial elections on the ballot, how many simply skip them? Do they just guess who vote for, because the candidate is Democratic or Republican? Or do they just vote for a familiar name? The challenges of judicial elections are similar to other local elected positions. 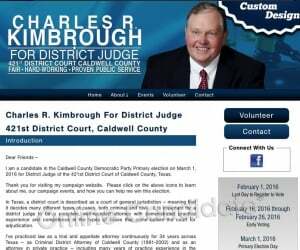 A judicial campaign website can help voters know more about a candidate for judge and help win the election. Online Candidate takes the difficulty out of building and maintaining your campaign website. It’s the perfect solution for judges, municipal court judge, county court judge, magistrate, and justice of the peace candidates. Order now and start your website in minutes. With four affordable options, Online Candidate is the fastest and easiest way to get your website up and running. First time running for office? Have questions about starting? Call Carol at 866-460-0995. 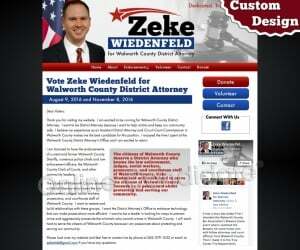 See our judicial website design gallery. Try the demo or compare the packages. 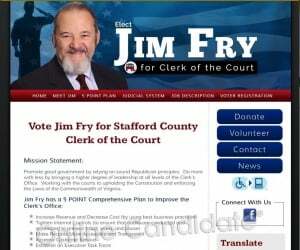 A campaign website allows judicial candidates can inform voters about their qualifications, a candidate biography and a description of the court where they want to serve. Voters can use this information to help them make wise choices on important judicial posts - from municipal court justices to supreme court judges. Home Page: The home page text should change often, but to start, you may want to create a ‘letter to voters’ announcing your campaign, why you are running and what you hope to accomplish if you win. In time, you can update this text to include new developments or to shift your focus from awareness to support-gathering. Biography/Resume: Start off with some personal information, such as family, time lived in the area, hobbies, etc. Then take your resume and work it into a short biography. Keep it short and bullet-pointed, but don’t simply make it a list of your career history. Work in a few words about what you did in those positions. Electing a judge is more than just whether are qualified - voters need to like you as well. Issues/Positions: This is the heart of your website content, and the most unique content you will create. Stake your positions and campaign platform. Endorsements: Include organizations and direct quotes, where possible. Endorsements can be added throughout your site, particularly when they are from a professional or legal organization. Voter Registration Information: Link to your state and/or county online voting registration pages. Use your website to keep in touch with supporters and send voting reminders before Election Day! Want to convert your website to a private practice or law firm website? We can help there, too. 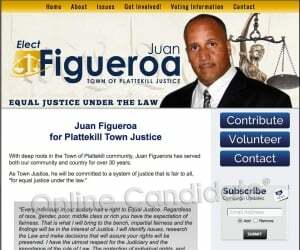 Get started now and give your judicial campaign the winning edge! 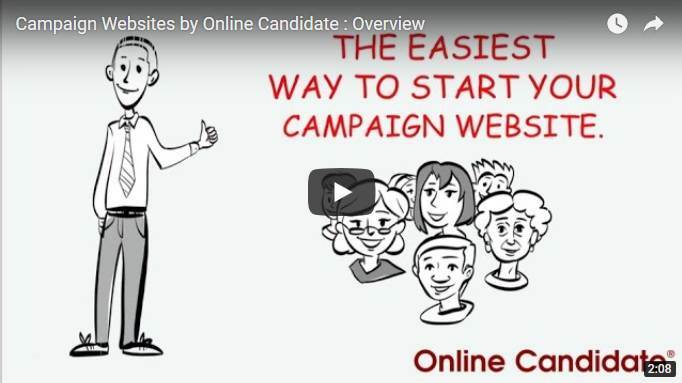 All Online Candidate sites feature our exclusive platform, tools and resources. For the Regular Campaign Website Package, we design a website header with your campaign colors, logo, background and candidate head shot. Don’t have a logo? No problem. We’ll create one for you. 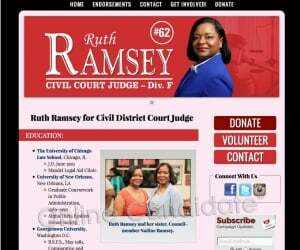 We also customize your site colors, font and background for a professional look suitable for any political campaign. You have full control over your content and tools. The Regular Package is your best option if you want a great custom design with logo and longer-term hosting. Learn more. 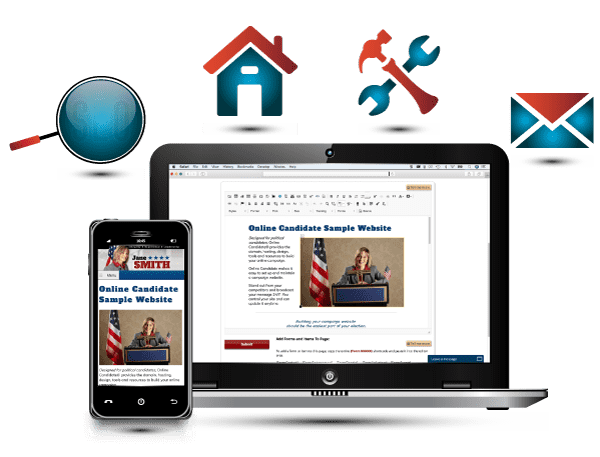 The Enhanced Campaign Website Package features ALL of the campaign web design customization of the Regular Website Package, but also includes the setup of your initial site content. Don’t have a logo? No problem. We’ll create one for you. We’ll arrange your text and images for a pleasing design and optimize your content for search engines. Then it’s all in your control. The Enhanced Package is a great option if you don’t want or don’t have the time to add the initial content yourself. Learn more. Our Lite Package is designed for campaigns starting with a tight budget or with a limited time-frame. Choose from a wide selection of website template images, colors, and fonts to create a unique look that works for any campaign. Then add your site content and go live. Want a custom design? You can upload your own header image or include a Custom Design Add-on. Many of our template color schemes have corresponding brochure print templates for offline marketing. 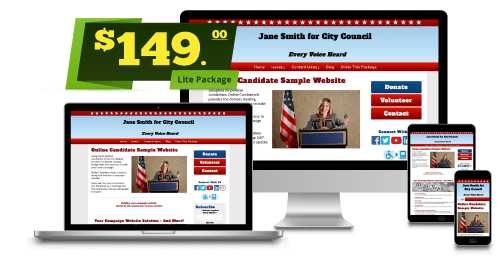 The Lite Package is best if your campaign is longer than 5 months or you want a one-time, fixed price. Custom design or site setup options can be added at any time. Learn More. Our Monthly Website Option includes recurring billing that can be cancelled at any time. Choose from a wide selection of template images, color styles, and fonts to create a unique look. Then add your content and goes live. Which Package Is Best For You? Find Out Here.